We were driving many miles to reach this royal palace somewhere in the North of Italy. 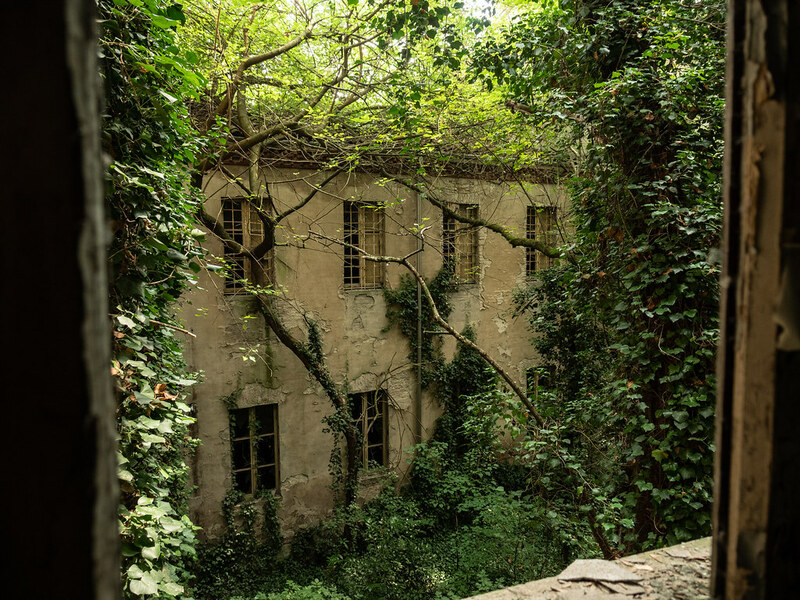 If you would see this magnificent building complex with huge park from the outside, you would never guess that this place is abandoned. Well, because it isn’t... At least not completely! Behind the church of the palace a totally forgotten section of the building is stretching, which has been decaying for more than 20 years now. But maybe its existence was just denied by the townsfolk. Because this is another one of those sinister structures with a cruel past. We had barely entered the area that’s off-limits for tourists but already here dense undergrowth was starting. Actually, this is more like a small jungle hidden in the middle of a city. This already really trashed place is another one of those Italian asylums. 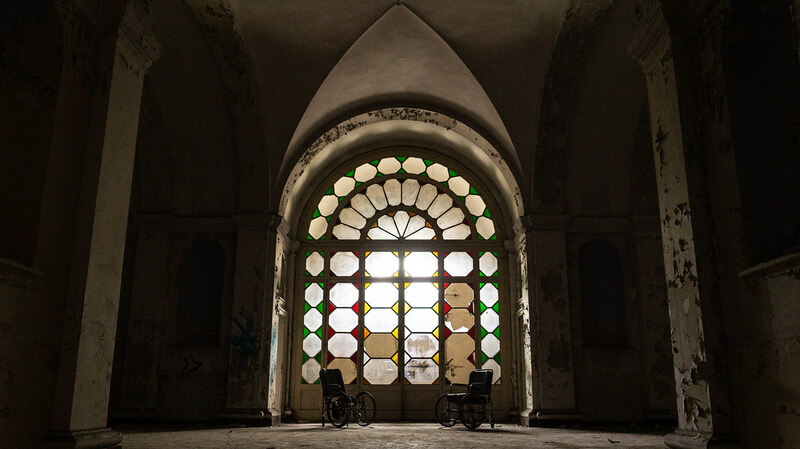 Around the year 1870 it was decided to move the mental hospital to the rooms of the ducal palace and its old monastery. It’s said that the reason for that was a cholera outbreak. Although the building complex wasn’t really suited for placing patients, they had to live here now. And at first this wasn’t really a problem. Because this was supposed to be just a temporary solution. And hey, after all it’s a palace! But during the course of time the situation didn’t change and so the former palace didn’t only become a madhouse but also a prison. Maybe you already know about the horrendous conditions in those mental institutions. But here’s the short version: All the facilities were crowded with patients. People were captivated, imprisoned, monitored and tortured. Nurses weren’t hired because of their professional abilities at all but because of their physical strength. Since there were way too few employees, nurses had to work in exhausting shifts. Many patients arrived at the asylum as kids and they spent their whole lives in here. Other patients might have been roamers or prostitutes. So, especially people who didn’t really have a psychiatric disorder but who wouldn’t fit to the ideal image of the Italian society. After they were interned, nobody had ever seen them again. Now we have reached the pompous entrance hall. It’s especially impressive and simply beautiful in so many ways. It’s this splendid, palatial architecture why we came here in the first place. 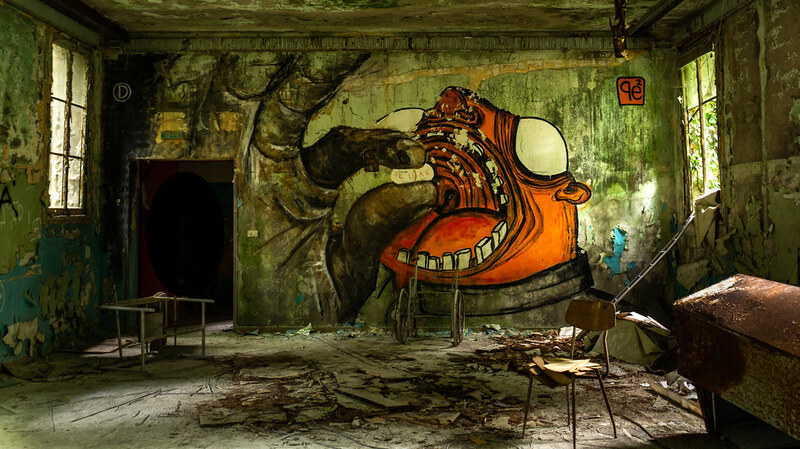 But we stayed for another reason: This place became the gallery of an internationally known street artist. The ongoing project “1000 Shadows” by the Brazilian Herbert Baglione represents the long story of pain and suffering which souls from the past had to go through. The painted silhouettes emerged at walls in cities all over the world. As it did here. Well-fitting to the sinister history of this facility. For us as huge street art enthusiasts a real highlight! 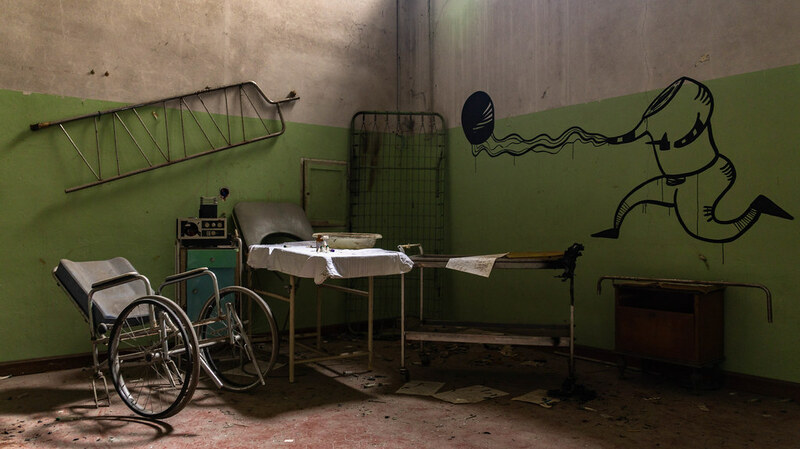 Although this hospital has a shocking past, it’s also the place where a revolution was started which changed Italy for ever. But for that we have to go back to the 60s of the recent century: The terrible state of the insane asylums was denounced more and more. Hospital personnel, students, teachers and many more people were fighting to bring the horrors of the asylums to the public. In 1969 this place had been at the center of the debates when students were occupying this clinic out of protest for 35 days. That period was the first time ever that no patient of the facility was beaten or even killed. Immediately after that, in 1970, Franco Basaglia was appointed as director of the clinic. You might remember that name. The law which was supposed to reform all the mental hospitals of the country was named after him. 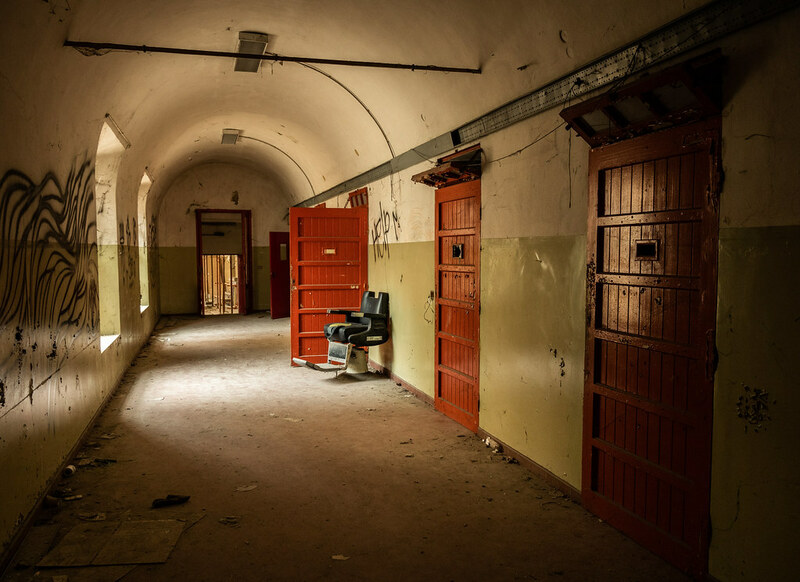 The psychiatrist was responsible for the asylum for one year only, but during that time he restructured the whole facility completely. Therapy now focused on the patient and not on his illness. So, a prison was finally turned into a place of caring. More and more patients here had been reintegrated in society and they got their lives back. In 1978, the Basaglia law equaled a real cultural and medical revolution. All over Italy mental institutions were now urged to gear themselves to Basaglia and this place right here when it came to treatment. Bad pharmacological therapy and electroshocks were finally abolished for good. 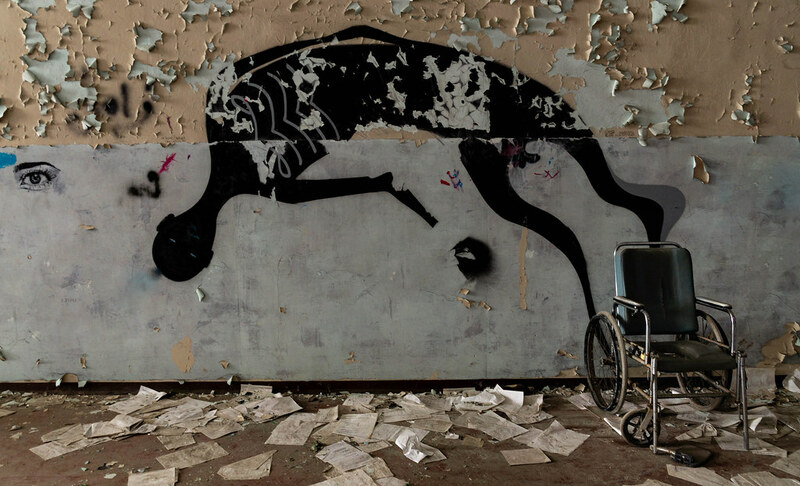 Since more and more patients could leave the hospital, this place was closed down in the 90s. There was simply no demand anymore. Today this former place of terror resembles a garbage dump. The building is in terrible shape. The structure is falling apart bit by bit and in some places it only holds together because of new support beams. However, it nearly seems like the public isn't really interested in this place anymore. 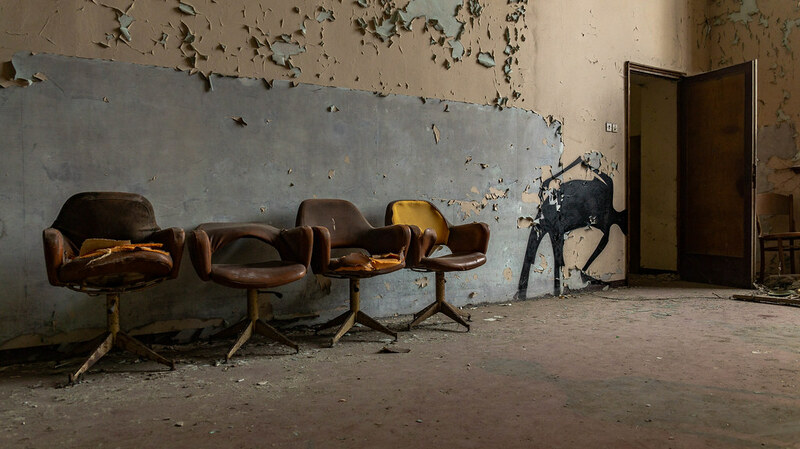 Even though the old clinic hasn't only an enormous historical value but also an artistic one. If it were possible to open this site to the public, and not only the main palace next door, this might become a real magnet for tourists. Think about it: A forgotten wing of a massive palace that was just rediscovered after more than 20 years, with many items from a dark past and an extensive gallery of a well-known artist... People would pay a lot of money to see something like this! And we were even able to see it free of charge. Superb, and I love the art work. Agreed. The haunting twisting shadows flowing on walls is perfect for the situation. The image of being fed a pill - I gasped. It sits perfectly in the decaying room.